In previous installments we have seen how the Red Army Faction survived the arrest of its leading members Andreas Baader, Gudrun Ensslin, Ulrike Meinhof, Holger Meins, and Jan Carl Raspe in 1972. Over the next years these individuals and other RAF political prisoners were subjected to isolation and sensory deprivation torture, and yet through the strategic use of hunger strikes managed to inspire a new generation of guerilla fighters on the outside. This struggle was not without its losses, though, and by 1977 several guerilla fighters had died, including three who died in captivity. The most recent of these, the RAF’s leading theoretician Ulrike Meinhof was said to have “committed suicide” at a key point in her trial in 1976, and yet later investigations would uncover evidence that she had in fact been raped and strangled, and then hanged to make it look like she had killed herself. 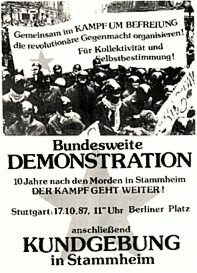 We have also seen how in 1977, a year after Meinhof was murdered, the guerilla embarked on its most ambitious operation to free the prisoners, assassinating the Chief Federal Prosecutor and attempting to kidnap two leading businessmen in an effort to force the State to release their comrades. While they failed to capture one of these targets, instead killing him, the other, former Nazi Hans-Martin Schleyer, was taken prisoner on September 5. As days turned to weeks and negotiations seemed to be getting nowhere, a Palestinian commando intervened, hijacking a plane and taking ninety people hostage, supporting the RAF and also demanding that two Palestinian prisoners in Turkey be freed. These events unfolded in September and October 1977. On October 17, a West German anti-terrorist commando stormed the airliner in Mogadishu, killing three guerillas and wounding the fourth. The next morning it was announced that Gudrun Ensslin and Andreas Baader were dead, having allegedly committed suicide. It was also announced that Jan-Carl Raspe and fellow RAF prisoner Irmgard Möller had “attempted suicide.” Raspe subsequently died of his wounds. 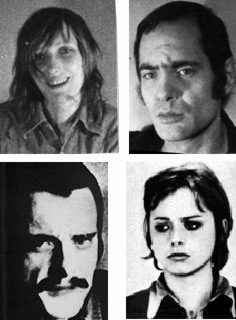 An examination of the contradictions surrounding the alleged “suicides” of Gudrun Ensslin, Jan-Carl Raspe, and Andreas Baader, contradictions no less numerous than in the case of Ulrike Meinhof’s death, tends to support the conclusion that the deaths were in fact murders. Baader and Raspe died as a result of gunshot wounds, Ensslin as a result of hanging, and the sole survivor, Irmgard Möller, suffered repeated stab wounds inflicted with a kitchen knife. As the two men were alleged to have shot themselves, some explanation as to where the guns had come from was necessary. Remember: the four had all been kept in complete isolation since Schleyer had been taken hostage, and had been in prison under strict conditions for years before that. Yet, such a thing does seem in fact to be “out of the question,” if not flatly impossible. Before entering the visiting area, lawyers had to empty their pockets and give their jackets to an employee for verification; they were body searched physically and with a metal detector. Prisoners were strip searched and inspected and given a new set of clothes both when entering and when leaving visits with lawyers. Further, due to the Kontaktsperre, the lawyers had been unable to see their clients after September 6. As regards Andreas Baader, a plethora of other irregularities are apparent. Baader is supposed to have shot himself in the base of the neck in such a way that the bullet exited his forehead. Repeated tests indicated that it is virtually impossible for an individual to position a gun against his or her own body in such a way. Equally curious, there were three bullet holes in the cell. One bullet lodged in the wall, one in the mattress, and the third, the cause of death, lodged in the floor. Are we to presume Baader missed himself twice? As well, Baader had powder burns from the recoil on his right hand. Baader, however, was left-handed, and would almost certainly have used his left hand to shoot himself. In the case of Raspe, no powder burns were found at all. Powder burns always occur when firing a weapon. The gun smuggling theory relied very heavily on the testimony of Hans Joachim Dellwo, brother of RAF prisoner Karl-Heinz Dellwo, and Volker Speitel, the husband of RAF member Angelika Speitel. They had both been arrested on October 2,1977 and charged with belonging to a criminal association. Under police pressure, both men would later admit to acting as couriers for the guerilla, and testify that they were aware of lawyers smuggling items to the prisoners during the Stammheim trial which had ended in April 1977 – specifically they eventually claimed that guns had been smuggled in. The scenario put forth by the state was that these guns were then hidden away in the walls of the cells as work was done renovating the seventh floor that summer. Yet Speitel and Dellwo’s testimony was tainted by the fact that they provided it in order to avoid lengthy stays behind bars. In exchange for these allegations they each received reduced sentences and new identities. As a result of their testimony, two defense attorneys would be tried and convicted of weapon smuggling in 1979. In the case of Gudrun Ensslin’s “suicide” there were further contradictions. The chair she allegedly used to hang herself was too far away from her body to have been used and the cable supporting her body would not likely have tolerated the weight of a falling body. As was the case with Ulrike Meinhof, the histamine test that would have established whether Ensslin was dead before she was hanged was never undertaken. In search of an explanation for this mass suicide, the state suggested that the prisoners realized there was no hope for their liberation following the storming of the hijacked airliner in Mogidishu and consequently chose mass suicide rather than life imprisonment. This explanation raises two questions. How would the prisoners, given the Kontaktsperre, have known about these developments? And, further, how would they have organized a group suicide under such conditions? On October 20, authorities claimed to have “discovered” a radio in Raspe’s cell, a cell that he had only occupied since October 4 it should be noted. The state alleged that, using the wall sockets and tools stolen while the prison was being renovated, the prisoners constructed an elaborate communication system that allowed them to monitor the radio broadcasts and to communicate with each other. This was only the first in a series of very useful “discoveries.” On October 22, two hundred and seventy grams of explosives were “discovered” in the prisoners’ wing. On November 12, a razor blade and three detonators were “found” in Baader’s cell. Finally, on December 12, a gun and ammunition were “found” in a cell formerly occupied by another RAF prisoner. It is worth noting that the gun in question was a Colt .38, the model used by special police units. While the details of what happened that night may never be known, and the state’s story cannot be 100% disproven, even taken at face value all the state’s claims do not point to “simple suicide”: in the final analysis their own evidence suggests that if prisoners would have had access to guns and radios then someone in a position of authority would have known it. Author Stefan Aust, for instance, suggests that the prisoners may have been allowed to believe they had established a “secret” communication system so as that what they said to each other could be monitored. 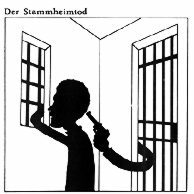 What emerges then is a picture of the prisoners being allowed to have weapons and being allowed to communicate with each other, and authorities listening in as a suicide pact was agreed upon and then acted on, all the while doing nothing to interfere (2) . Yet one of the biggest problems with the suicide story, even in this form, is the fact that not all of the prisoners had died. On October 27, Irmgard Möller, the only survivor from the alleged group suicide attempt, issued a statement claiming that she had NOT attempted suicide. She said that the last thing she heard before going to sleep on the night in question was two muffled explosive sounds. She was not aware of anything until she awoke some hours later feeling intoxicated and disoriented and having difficulty concentrating. She further stated that the prisoners had no contact with one another except by shouting through the air vents in their cells or when going by each other’s cells on the way to or from the yard. Finally, she said the prisoners had absolutely no idea of developments in Mogadishu. To this day, she maintains that the prisoners were murdered. It is difficult to dispute such a claim, coming as it does from a woman who survived these events. Although no independent international commission was ever formed to investigate the Stammheim deaths, the commission investigating the death of Ulrike Meinhof was still sitting at the time. They had several interesting comments. They noted that on both nights, May 8-9, 1976 and October 17-18, 1977, an auxiliary was in charge of surveillance rather than the usual person. They also noted that in both incidents the autopsies posed similar problems. (1) In recent years some, including RAF prisoners of the first generation, have claimed to know of a suicide pact involving the prisoners and have claimed certain knowledge that the deaths were a suicide. Irmgard Möller, the sole RAF survivor of the day’s violence continues to insist that there was no suicide pact and that the prisoners were murdered. Unlike Möller, none of the other prisoners making these claims have any direct knowledge of what happened on the seventh floor of Stammheim prison on October 17 1977, and for that reason, and given the many contradictions in the state’s explanation, we choose to believe the sole survivor of that night’s events. 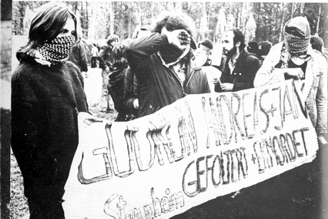 (2) In this regard see Stefan Aust’s book The Baader-Meinhof Group, pages 432, 482-3, 487-8, 496-7, 550-552. Regarding the possibility that police might have learned of guns in Stammheim fom Volker Speitel as early as October 4, see page 484. It should be noted that although Aust claims to believe the prisoners committed suicide, he emphasizes that there remain serious inconsistencies in the official version of events, including evidence pointing to the possibility that Baader was shot by a gun with a silencer on it, which would mean that the murder weapon was removed after he was killed (547), and also that guards lied when they claimed Möller had lifted her sweater before allegedly stabbing herself (548), a “fact” which the state claimed proved suicide as an assassin would not have tried to save the victim’s clothing. (3) Republished in a variety of sources in October 1987, the tenth anniversary of “The German Autumn,” our copy is a photocopy of the original that was circulated informally. A version of this text is also produced in Aust op cit. page 489. (4) Libération(Special Issue) Paris 1978, p. 27. (5) Aust op cit. p. 526. 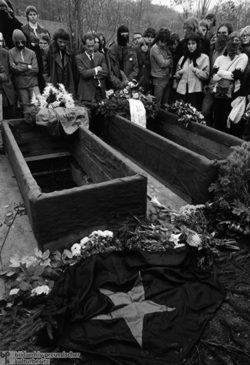 (7) La Mort d’Ulrike Meinhof: Rapport de la Commission international d’enquête, Librairie François Maspero, Paris, 1979, p. 67. (10) Libération, op. cit, p. 43.